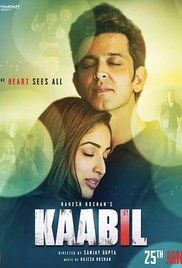 Rohan Bhatnagar (Hrithik Roshan) is a kind, happy young man who has been blind since birth and works as a voice-over artist for a living. Through friends, he meets Supriya Sharma (Yami Gautam), a working woman who is also blind, but proudly independent. The two start liking each other and get married. One night, on their way back home after dining out, they are interrupted by Amit Shellar (Rohit Roy), a local goon and younger brother of Madhavrao Shellar (Ronit Roy), a well-known politician. He and his friend Wasim, drunkenly misbehave with the couple, enraging Rohan, and they have a heated exchange. Read more on Wikipedia.